Drinking cucumber juice is a relatively new phenomenon but like other fruit and vegetable juices, it is a highly concentrated source of nutrients that can deliver a number of health benefits. Cucumber juice is prepared from cucumbers, which are long and dark green vegetables bearing the scientific name Cucumis sativus. This creeping vine plant is cultivated in many countries around the world, but it is primarily grown and distributed from China. Cucumbers are coated with a thick, waxy skin that helps to keep them fresh, making these vegetables highly prized in culinary applications. However, juicing this simple vegetable is another great option to access a concentrated form of its many healthy nutrients. Packed with minerals like copper, magnesium, and potassium, cucumber juice is excellent when it comes to bone health and increasing bone mineral density, which can help prevent osteoporosis and other age-related bone disorders. Moderate amounts of vitamin A, in addition to other antioxidants found in this juice, can help to protect our vision health as we age. Macular degeneration is caused by oxidative stress in the center of the retina, causing strain in vision, but this juice can eliminate those free radicals before they can do serious damage. 3 medium cucumbers;1 cup of water (if necessary, to improve consistency);Lemon or Lime Juice (for flavor, if desired). Step 1 – Remove the skin of the cucumbers with a knife or a potato peeler. Step 2 – Slice and chop the cucumbers into a manageable size. Step 3 – Add the cucumbers to your blender or food processor. Step 4 – Blend for 1-2 minutes for an even consistency of the juice. Step 5 – Pour the blended cucumbers into a sieve or cheesecloth, allowing the juice to filter through into a jar. Step 6 – Press the cucumber fiber with a spoon, squeezing out as much juice as possible. Step 7 – Discard the cucumber fiber. Step 8 – Add water, if necessary, along with lemon or lime juice, to taste. Step 9 – Refrigerate the pure cucumber juice. Facial Scrub: You may have placed cucumber slices over your eyes during a spa treatment, but you can also apply cucumber juice directly to the skin in the form of a refreshing face wash. This can clear out pores, moisturize the skin and give you a healthy glow. Allergic Reactions – Allergic reactions to cucumber are not uncommon, although most people would have discovered this at some point earlier in life. However, large quantities of this vegetable can trigger a reaction, such as swelling of the lips, gums or throat, shortness of breath, or skin irritation/hives. Bloating and Gas – A frequent side effect of consuming too much cucumber juice is gastrointestinal distress, mainly in the form of cramping, bloating and excess gas. 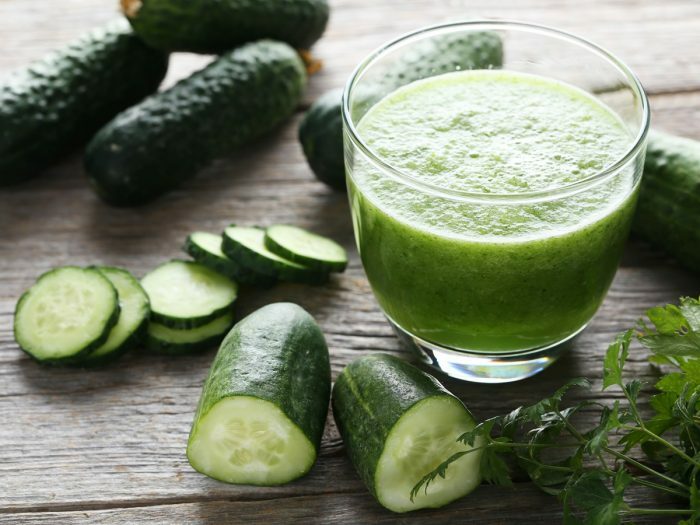 Kidney Problems – With high levels of potassium, drinking an excessive amount of cucumber juice can be damaging to the kidneys, if you develop hyperkalemia. This can also affect muscle function and nervous system health, which can be avoided by drinking this juice in moderation, i.e., no more than 2 glasses per day. Pesticide Exposure – Cucumbers are susceptible to pesticide exposure, but much of that is kept out of the vegetable itself by the waxy outer skin. That being said, always wash your cucumbers before eating them and peel the skin off thoroughly before juicing.